3.6 out of 5 based on 49 bloggers and 3 commenters. 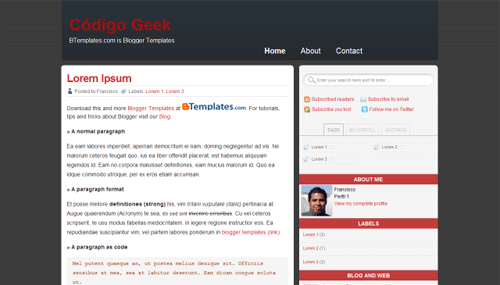 Código Geek 2.0 is a free blogger template adapted from WordPress with 2 columns, right sidebar, web 2.0 design, rounded corners and social bookmarking icons. Hay un problema despues de instalar, es que no me deja modificar la etiqueta, blogroll y los archivos. Puede ver en la imagen.